The World Bank has revised downwards its 2014 GDP growth projections for the three nations worst hit by the current Ebola outbreak – Liberia, Sierra Leone and Guinea. “The Ebola epidemic continues to cripple the economies,” it said. Its report comes as bank President Jim Yong Kim begins a two-day visit to West Africa to assess the impact. The World Health Organization (WHO) says 5,987 people have died from Ebola in the three nations. The latest World Bank report still shows positive projected growth there for 2014, but at much lower rates. It said that “all three countries had been growing rapidly in recent years and into the first half of 2014”. The bank is now also projecting negative growth for two of the nations in 2015 – Guinea and Sierra Leone. The World Bank has said it is mobilising $1bn in financing for the worst-hit nations. On Monday, the World Health Organization (WHO) said the 60-day goals it had set itself for tackling Ebola in the three nations were largely met. The WHO had set a target of isolating and treating 70% of patients and of safely burying 70% of victims in Liberia, Sierra Leone and Guinea by 1 December. Dr Bruce Aylward, the assistant director general in charge of Ebola response for the WHO, said only the treatment figure in Sierra Leone had fallen below the mark. Dr Aylward said the “yawning gap” between disease levels and the capacity to cope had narrowed significantly. 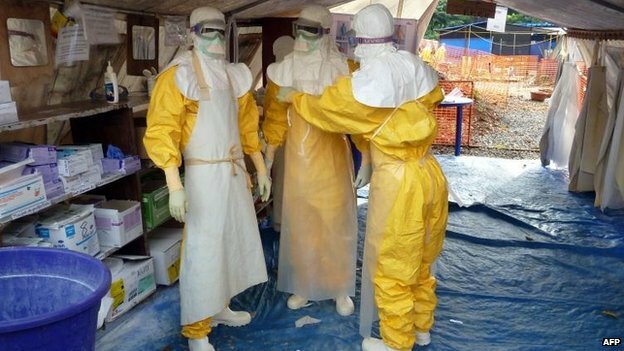 Earlier, the head of the UN Ebola response mission in West Africa, Tony Banbury, told the BBC there was still a “huge risk” the disease could spread to other parts of the world. Speaking in Sierra’ Leone’s capital, Freetown, Mr Banbury said: “It may spread around this sub-region, or someone could get on a plane to Asia, Latin America, North America or Europe… that is why it is so important to get down to zero cases as quickly as possible”.